The abuser feels more powerful when he puts down his victim. Does this mean that the abuser actually feels more powerful when he (or she), for instance, subtly puts down his partner’s interests? Yes, as incomprehensible as this is to some of us. Does this mean that their partner feels put down? Not always. He or she may feel a twinge of sadness because they cannot share this interest. Or he or she may feel a twinge of sadness that their partner can't enjoy, say, a particular artist or composer. Does this mean that the abuser can't (or doesn't) enjoy this pleasure? Not always; he or she may simply find greater pleasure in feeling that they have power over their partner. Blocking and diverting is a form of withholding in which the abuser decides which topics are "good" conversation topics. 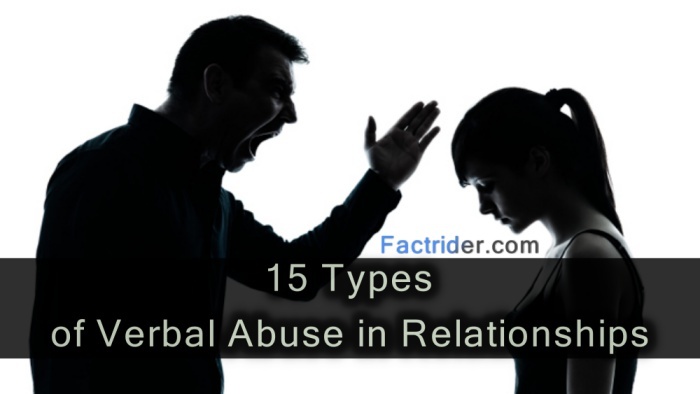 An abuser practicing this form of abuse may tell the victim that she is talking out of turn or is complaining too much. Judging and criticizing is similar to accusing and blaming but also involves a negative evaluation of the partner. As Evans points out, “Most ‘you’ statements are judgmental, critical, and abusive.” Some abusive judging and criticizing “you” statements are: “You are never satisfied"; “You always find something to be upset about”; and “No one likes you because you are so negative." Denial is abusive when it consists of denying one's bad behavior and failing to realize the consequences of this behavior. An abuser will always try to find a way to justify and rationalize his behavior. This is a way of denying that he has done anything wrong.